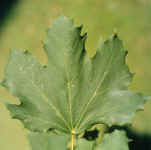 Summer foliage is dark green and turns yellow in the fall. Suggested uses for this plant include shade, specimen plant, and street tree. Transplants readily. Adapts well to wide range of soil conditions, including clay soils. Tolerates air pollution. Salt tolerant. Tolerates hot, dry conditions better than Sugar Maple. Prune diseased or storm-damaged wood as needed. Because of this tree's dense foliage and shallow root system, mulching around the base of the tree is suggested since it is hard to get anything to grow under it. Susceptible to Verticillium wilt, anthracnose, and some leaf scorch. `Crimson King' has purple leaves that retain their color all summer. `Columnare' is one of several varieties with a narrow, columnar habit of growth. `Globosum' is a low growing, round-headed tree that can be used under utility wires. Native to Europe, but has been widely planted throughout the eastern United States. More upright and smaller cultivars are better choices as street and lawn trees.